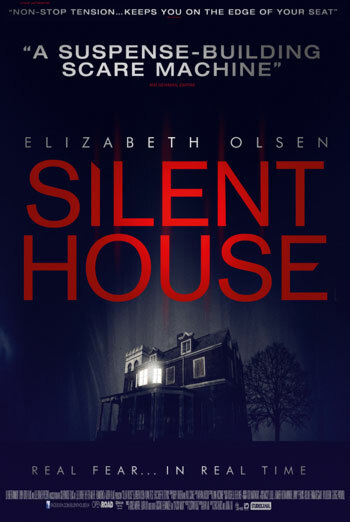 SILENT HOUSE is an American remake of a Uruguayan horror film about a young woman who is helping to renovate her family's remote holiday home when she finds herself under attack and trapped in the dark house. The film was classified '15' for strong violence and sustained threat. The violence is not detailed in visual terms and mostly occurs off screen. However, there are several shots showing people with bloody injuries resulting from violence and one scene in which a man beats a struggling woman with his belt while verbally abusing her. This exceeds the terms of the BBFC's Guidelines at '12A'/'12' which state that violence 'should not dwell on detail' and that 'There should be no emphasis on injuries or blood'. There is also a strong sense of threat which is sustained throughout most of the film, exceeding the terms of the BBFC's Guidelines at '12A'/'12' which state that 'Moderate physical and psychological threat may be permitted, provided disturbing sequences are not frequent or sustained'. A further issue is the revelation of a history of child sexual abuse taking place in the house. This is never explicitly stated and is only suggested in a fairly discreet way. For example, in one scene we hear a man telling a young girl to "play a new game" while he takes photographs of her. We only see the man's feet walking around the room during this conversation, so there is no visual depiction of abuse, and the delicate treatment of this difficult theme is appropriate for viewers aged 15 and above. This film also contains some mild bad language and one use of strong language.